Product prices and availability are accurate as of 2019-04-26 03:57:40 EDT and are subject to change. Any price and availability information displayed on http://www.amazon.com/ at the time of purchase will apply to the purchase of this product. 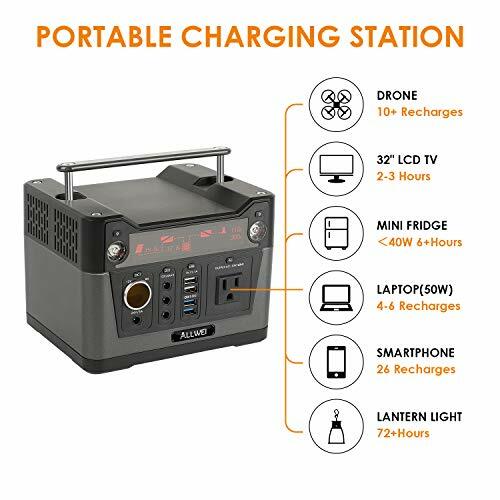 288Wh 12v/ (26Ah),3.7v/79200mAh powerful charging station for camping or emergency backup. 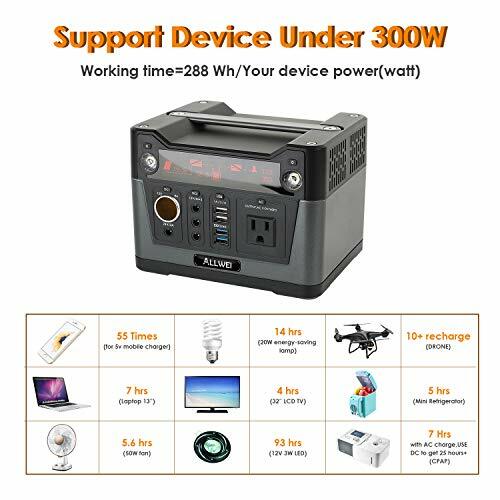 With 120V AC (300W Rated / 600W Surge) US-standard outlet for your Laptop, Monitor, TV, Air Mattress, Lamp, Fan, Router, Modem, Christmas lights etc. With 1*24V DC (24V-3A). Especially for connecting 24v CPAP,like for Resmed CPAP machine. With 4* 5V USB ports (two QC3.0 fast charge) for phones, iPad, gps, mp3, camera, rc helicopter etc. 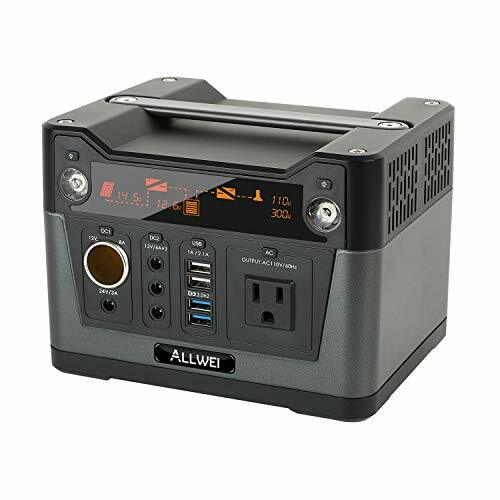 This Portable power station has two ways to power your CPAP machine: 110V AC Plug or 12V/24V DC Plug. We strongly recommend that CPAP users use DC CONVERTER to work with this power station and turn off or remove the HEATER/ HUMIDIFIER, thus it should last at least 4 nights. To buy the DC converter, please consult with your CPAP supplier or simply reach us for a guide. 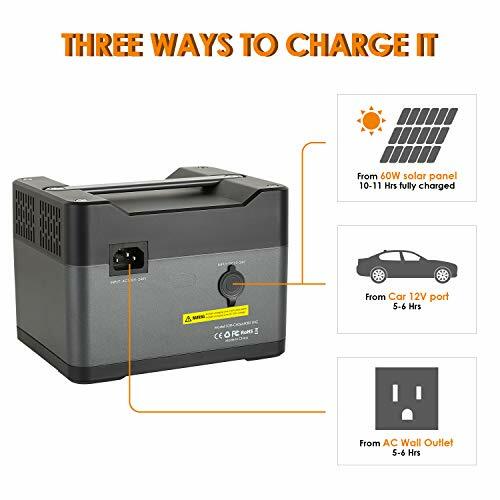 3.Could I put this generator into direct sun light when it was charged by Solar Panel ? Please keep this power station in the shade at all times. Only the solar panel is in the direct sunlight,Please don't put this generator in direct sunlight . 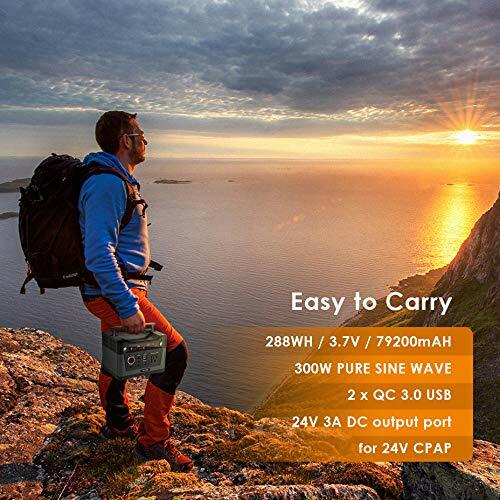 288Wh lithium portable power Generator: 288Wh 12v/ (26Ah),3.7v/79200mAh powerful charging station for camping or emergency backup, Hurricane, Storm and Outage,widely used for indoor or outdoor such as family, office, travel, fishing, hunting, farm,CPAP machine (*Use DC-DC converter from your CPAP would get longer hours) With 3 Ways Input Charging: Home wall AC outlet power(5-6 hours fully charged), Car cigarette DC 12V/24V power(5-6 hours fully charged) and 18v 60-100W solar power panel(10-14 hours fully charged).The solar panel is not included, you need to buy separately! 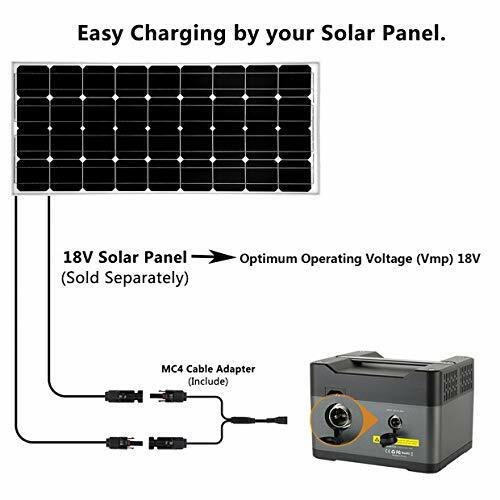 Powerful AC, USB and 12V DC outputs: comes with 3*DC output 12V/4A, 1*DC output 24V/3A,1*AC output 110V,2*USB 5V/2.1A, 2*USB QC3.0, these ports charges or powers products such as laptops, phones, tablets, cameras, drones, CPAP machine, small home appliances and more,24V 3A DC output port for some 24V CPAP or other 24VDC device,one 12V Car cigarette lighter,suit for car refrigerator car air compressor. Automatic energy-saving dormancy Mode: with ECO Mode that when the product detects that the connected device consumes less than 1W within 30 minutes, it will automatically enter the energy-saving sleep mode and shut down the work. Re-awake needs re-press the switch of the product output port and ensure that the connected device is higher than 1W. 300W Pure sine wave: Better than modified sine wave, high efficiency, high frequency, with Intelligent CPU control mode, Key switch output,stable technology, suitable for all kinds of load, can be connected to many electrical equipments and no interference.Additional 18-Month Warranty and friendly customer service.